Simon Pegler 1979/80 member of the IOBA, would like to offer to ex-service personnel and those who attended the Indefatigable School ‘Old Boys & Staff’, access to good working order, reconditioned Mobility Equipment & Disability Aids for daily living. Equipment will be free of charge, all you pay for will be the postage of the item sent to you. Simon’s website Ex Service personnel page, has been created for the sole use of Ex Service personel, Members of the Merchant Navy, past pupils of TS Indefatigable and their Families. All products shown are used but in very good condition, Mobility 2000 offer them free of charge to any of Ex Service men/women and their familes. If you require more than one product please call Simon on 01253 820303 and if they can fit the items in one box there will only be a single postage cost. To verify your entitlement please include your service number in the VAT exemption section of our checkout when ordering. It’s hoped that this is of use to you and we ask to you share it with as many people as you can, if you think they would benefit. Please contact Steve Humphries: IOBA Secretary for more details. 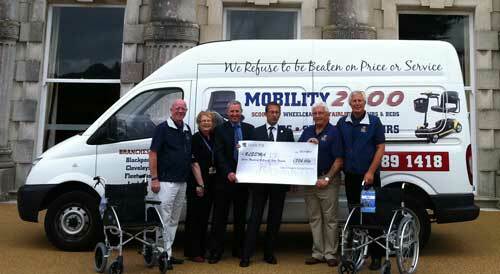 In 2011 Mobility 2000 Ltd and the Indefatigable Old Boys Association presented the British Limbless Ex-Service Men’s Association (BLESMA)with six wheelchairs and a cheque for £784 at Tedworth House, Tidworth, Wiltshire. The money was raised through the 2011 Indefatigable Old Boys Association annual reunion. The wheelchairs were added to the extensive range of support equipment owned by BLESMA, which supplies its membership with wheelchairs and prosthetic support to carry out daily activities.